The muffuletta is a classic New Orleans sandwich made famous by Central Grocery, layered with a few different cured meats, provolone and a tangy olive and tomato relish that soaks into the crusty bread. It’s a fun, easy and delicious way to feed a crowd. I happen to like adding a layer of lettuce, I know it’s not customary, so leave it out if you’re a traditionalist. Dissolve the sugar in the white vinegar. Add the sliced red onion and marinate in the refrigerator overnight. 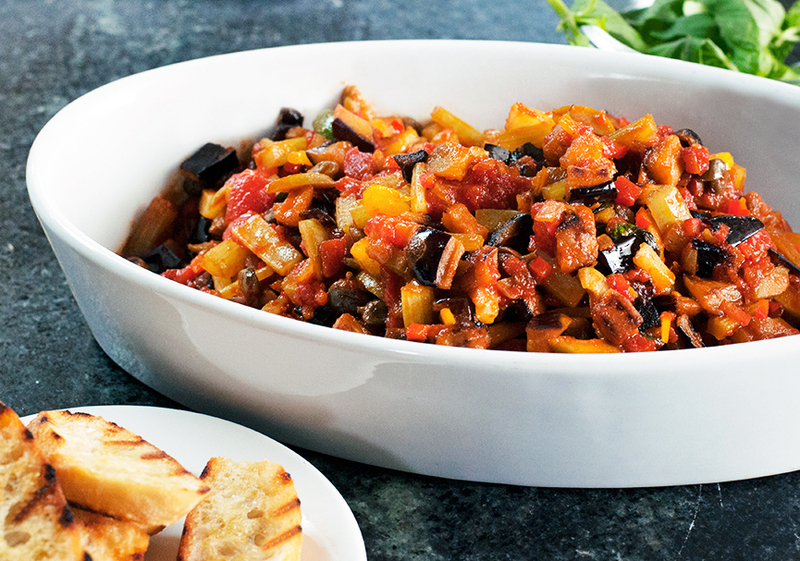 In a large bowl, mix together all of the sandwich relish ingredients. 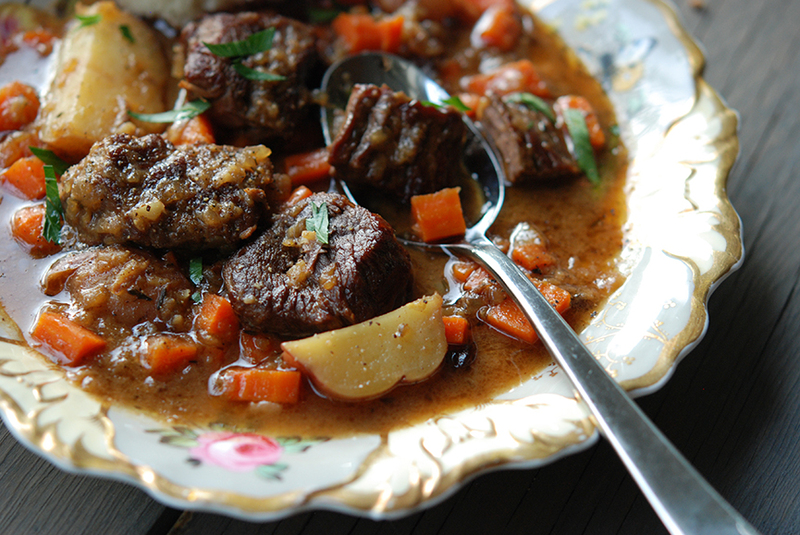 It gets better the longer it marinates, so allow it to sit overnight in the fridge if you can. Slice the bread in half. Put a thick layer of the olive relish on the bottom piece of bread. 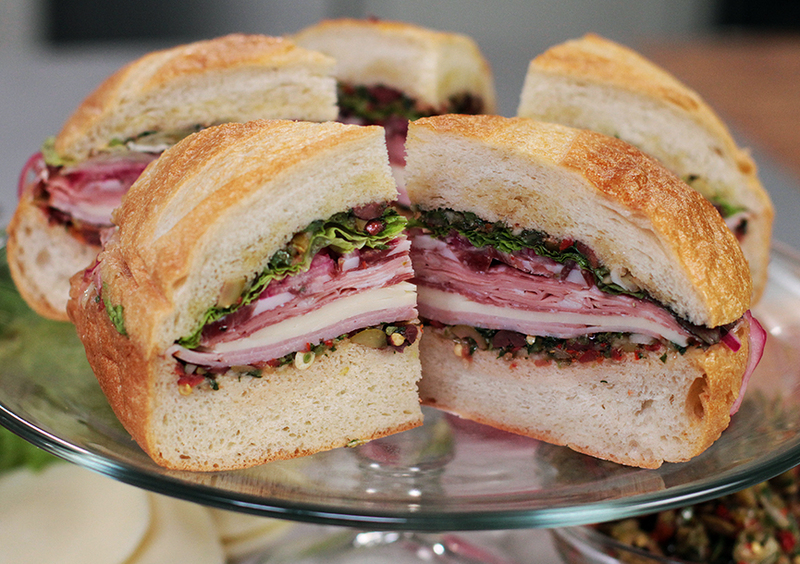 Layer with slices of ham, provolone, salami and mortadella. Top with pickled red onion, a few pieces of lettuce and a couple more scoops of olive relish. Drizzle the top piece of bread with olive oil then cover the sandwich. Once you’ve built the sandwich, wrap it tightly in plastic wrap. Let it sit for 2 hours, turning half way through to allow the juices to be absorbed equally in the bread halves. Cut into pie slices for serving.